WPI nourishes the minds for personal and professional transformation in order to achieve sustainable world peace. As our society consists of collective individuals, once each individual attains inner peace, the world peace becomes desirably promising. Though it may sound idealistic, let us walk you through this! It is our ultimate belief that the cultivation of a peaceful mind leads to peaceful action that prevents individuals from hurting themselves and others in any way possible. Furthermore, it increases the tendency of people making righteous decisions in their livelihood, in their relationship and in their contribution to the world. Hence, we offer free online Self-Development Programs and a series of training programs to increase the awareness and educate people around the world including young leaders, minorities, marginalized and underprivileged groups. Since established, there has been a high demand for help from many regions including conflict and after-conflict zones. Your gift today, big or small, will truly transform lives of many people in different corners of the world. Our bodies need food and nutrients to survive, so does our minds. Though harder to see from the eyes, it’s easy to see from the mind. WPI envisions sustainable change happening when each and every one of us works towards their own self-development. 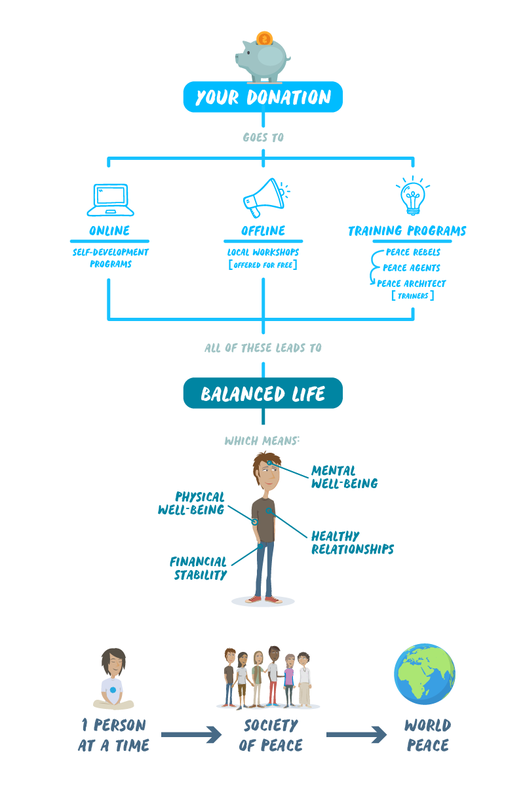 Thus, we have created free and accessible tools for the empowerment and wellbeing of individuals worldwide, regardless of age, race, religion, cultural background. 2008-2019 © All Rights Reserved.